Submitted by User on August 24, 2008 - 15:50. Hello everyone my name is Arsalan and before i proceed i want to thank Edward Revy and all the other people who have shared their amazing trading systems over here. 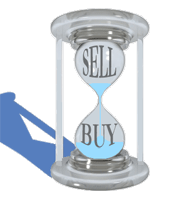 I have learnt many trading systems at this website which i use in my trading and they work very well for me. I have been using a strategy which gives me consistent profit so i would like to share that strategy with everyone over here. Indicators: 3 DAYS EXPONENTIAL MOVING AVERAGE. 10 DAYS EXPONENTIAL MOVING AVERAGE. BUY SETUP : +DI MUST BE ABOVE -DI . BUY WHEN 3 DAYS EMA CROSSES 10 DAYS EMA FROM DOWNSIDE TO UPSIDE. SELL WHEN 3 DAYS EMA CROSSES 10 DAYS EMA FROM UPSIDE TO DOWNSIDE. I use this strategy for trading stocks but i hope it will work for forex also because the systems mentioned here for forex trading works well for stock trading that's why i thought my system will work for forex as well. Please paper trade this strategy before you trade with real money. Once again i want to thank you and please pardon me if i have made any mistake in this article. Thanks Arsalan, your feedback and contribution are greatly appreciated! Happy profitable trading to you as well! Submitted by User on March 5, 2013 - 23:56. Hi arsalan.. i would like to ask. 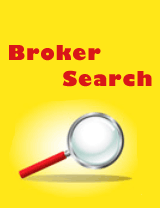 How do we setup the adx indictor. But for the color part. There is a lightseagreen, yellow green and wheat?.. How do we know which is +DI and -ve DI? How do we set it to be the same like yours? Submitted by User on November 21, 2012 - 15:50. Thank you very much for this wonderful trading setup. I was wondering just how long are we suppose to ignore ADX when it's falling. You said when ADX is falling from a high buy point it's useless that we should ignore it and wait for another trade setup, so my question is how long do i have to ignore it? What if it falls and suddenly starts rising again, should it still be ignored? At what levels are these swings important. Thanks. Submitted by User on November 7, 2012 - 12:36. Submitted by Christoph on June 1, 2012 - 16:23. EMA 60 and 90 and ADX 60. I also noticed, changes of DI+/Di- period do not impact strategy performance so much. Submitted by User on April 1, 2012 - 13:34. Submitted by User on March 12, 2012 - 23:38. 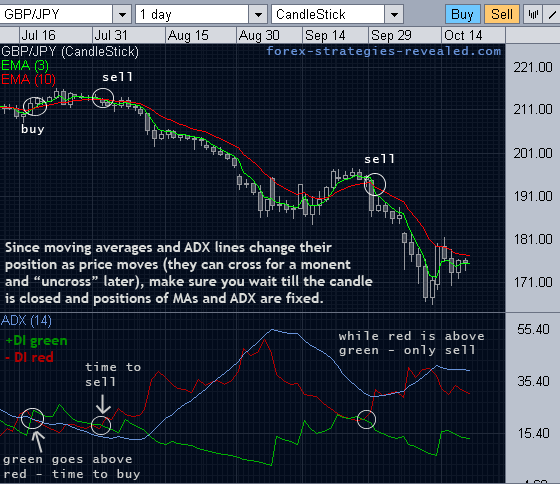 The best entry with this strategy is ADX must be =>25 when the Moving average crosses.the above is not right. Submitted by Enrico on March 1, 2012 - 23:18. Hey man, you should be aware of the fact that the ADX is a little bit slow for the Intraday Chart, so you should accelerate the ADX by calculating it with 9 periods instead of 11. You should be aware of the fact that if you had a decretive ADX there is not a probably trend going on. You should only trade with a crescent ADX that is oscillating in the middle of the DI- and the DI+. You should filter up this Moving averages crossings by using these configuration of the Directional Movement. Submitted by User on January 14, 2012 - 09:46. Submitted by Mallikarjuna K on September 8, 2011 - 19:36. I am Mallikarjuna K,I congratulates to your good stratagie.It is very five. Submitted by User on December 6, 2010 - 22:59. Submitted by User on November 22, 2010 - 21:05. What about late entry? i see in my chart the EMAs already crossing far behind. Submitted by User on November 6, 2010 - 15:34. With higher time frame - fewer false signals. Submitted by User on October 29, 2010 - 10:18.
any time frame also can? Submitted by User on October 18, 2010 - 23:32. I believe this strategy may work better in forex than stock! I tested such strategies combining DMI and MA using Ninja trader, and it works very well in forex, especially the strong trending pairs, such as EUR/USD. The disadvantage of it is it will send out many false signals when in whipsaw or not in a strong trend. Because forex and future has better trend than stocks, so I guess this strategy may works better in forex/future than stock market. Thanks. Submitted by Dave on June 11, 2010 - 11:37. What strategy do you prefer on a daily chart, this one or the Stoch + EMA crossing one?